Posted on Wednesday, December 4th, 2013 at 12:51 pm. The job of many professionals involves communicating within or outside an organization. 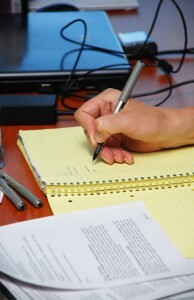 For building skill in business communication, consider Business Writing Training Course from pdtraining in Miami. Presentations, writing business mails, negotiations, and communication within the organization require specialized skills in communication. For businesses, professional development in business communication helps in building the reputation of the company, preventing conflicts and misunderstandings, and contributing to the smooth functioning of business processes. With online mediums of communication such as social networking sites, blogs and emails, writing are also used for reputation management, promotion, marketing and resolving consumer complaints. The written word, whether it remains within the organization or is read by those outside it, is a medium through which people judge the professionalism and worth of a company. Verbal communication is both formal and informal, and each requires different skills. Giving presentations, negotiating with other businesses, public speaking, providing criticism and conflict resolution are some of the areas in which formal communication is required. The purpose of verbal communication is to express oneself or to influence the other person(s). Depending on the purpose, verbal communication needs to be tweaked. How we stand, move, sit, listen and talk contribute to communication. Body language, if understood and used correctly, can make us understand others and express ourselves significantly. For example, during a negotiation, if the other person leans back, or begins to look around, or crosses his arms, the message you are getting is that he is not convinced by your arguments. If, on the other hand, he is leaning forward, listening to you attentively with his arms open, it shows that he is interested in what you are saying. Body language plays a vital role in communication. Training in understanding and using body language help professionals express better and influence easily. Paralanguage involves the loudness, rate, pitch and frequency of speech. Many people begin to speak very fast when nervous, some begin to stammer. Identifying and training one’s own speech is important for those professionals that need to verbally communicate with customers, business partners, and/or the audience. Business communication includes many kinds of communications, and each of them is immensely important in the smooth and efficient functioning of processes both within and outside the organization.